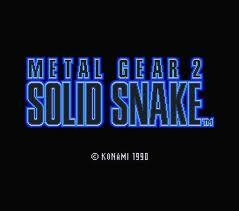 play Metal Gear 2 | JAMSX Retro MSX1 / MSX2 Computer Games in Your Web Browser. Metal Gear 2: Solid Sna..
Metal Gear 2: Solid Snake is an overhead action-adventure stealth video game, taglined as a "Tactical Espionage Game", that was originally released by Konami in 1990 for the MSX2 computer platform. The game was designed and written by Hideo Kojima, who also designed the MSX2 version of the original Metal Gear. Due to the declining support for the MSX platform by the time of its production, Metal Gear 2 was initially released only in Japan - instead an earlier produced NES game titled Snake's Revenge served as the Metal Gear sequel in North America and Europe. However, Kojima would continue the series years later with Metal Gear Solid, which follows Metal Gear 2 and features an in-game plot summary of its events. An English version of Metal Gear 2 have since been included in certain releases of Metal Gear Solid 3: Subsistence for the PlayStation 2, as well its HD Edition released for PlayStation 3, Xbox 360 and PlayStation Vita. The game was also re-released in Japan as a digital download for mobile phones and the Wii Virtual Console. Set in 1999, a few years after the events of the original game, Solid Snake must infiltrate a heavily defended territory known as Zanzibar Land to rescue a kidnapped scientist and destroy the revised Metal Gear D. The game significantly evolved the stealth-based game system of its predecessor "in almost every way", introduced a complex storyline dealing with themes such as the nature of warfare and nuclear proliferation, and is considered "one of the best 8 bit games ever made."